The SharePoint Begins and MAY THE COMMUNITY BE WITH YOU ! With the global event of Future of SharePoint by Microsoft, here I’m covering some key areas highlighted during the presentation and demo. This is a Foundational release not the last server release. Born in the cloud, Delivered on-premises, Hybrid at core. The Most Comprehensive, Validated, tested version of SharePoint history so far. Built for continuous innovation and improvements. The first point is a huge breath release for all SharePoint lovers across the globe for sure. Swipe your sweat and this is the biggest news on the event which means the absolute SharePoint era is just began. 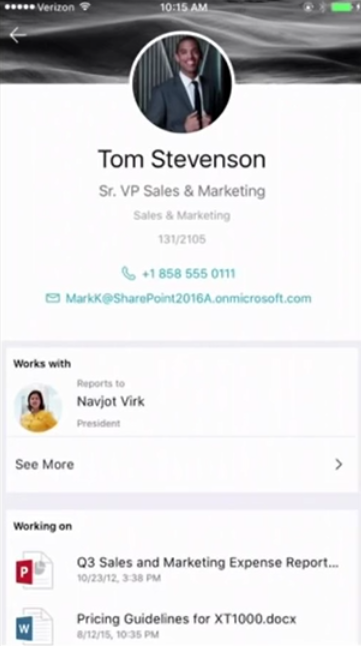 Finally with the mobile first cloud first strategy, Microsoft brings SharePoint in to the arena with trending capabilities with all new technological changes. SharePoint 2016 is the most comprehensive, validated and tested version so far. bringing the power used in Office 365 in to SharePoint 2016 is a big leap in terms of performance and experience. and that seems to be very much true because my deployment proved it with the experience I had with SharePoint 2016 compare to 2013. Performance and experience wise, this is obviously the most robust and wonderful (few things yet to come though !). 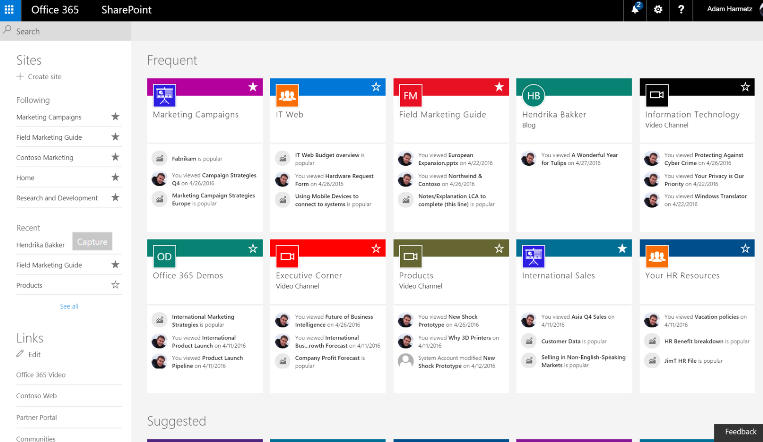 SharePoint is very much core to the productivity and core to the Office 365 platform. And it is central to Office 365. This means a lot for SharePoint community indeed. It is obvious in this people and data centric era, SharePoint acts the biggest role. It was previously the SharePoint wheel if you remember. Those features won’t die and don’t get misled with this image. This isn’t the new version of SharePoint wheel. These are the improvements were highlighted by Microsoft as bolt investments carrying out. Easy and faster site creation with the Group Integration and a brand-new UI. 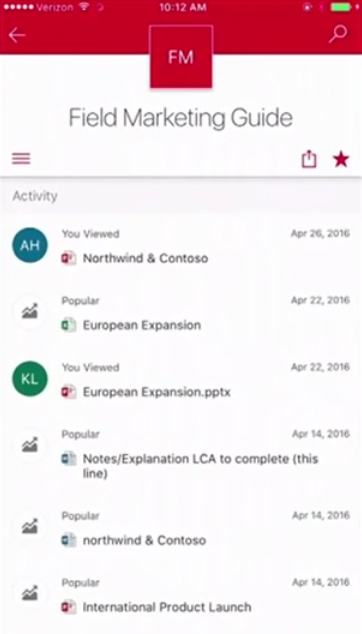 New Mobile App for both SharePoint online and On-Premise will be rolled out this year. 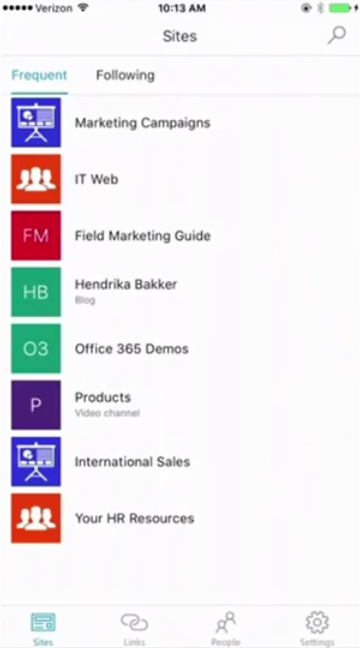 Mobile app isn’t new but an effective and nice looking mobile app was one thing missed the most for SharePoint specifically for Intranets. Ultimately you will get your Intelligent Intranet in your Pocket with these wonderful capabilities along with Office Graphs. Activity Feed for various sites will allow you to navigate across sites and content easily than ever before. Used office graphs to Display people who often interacts with you. 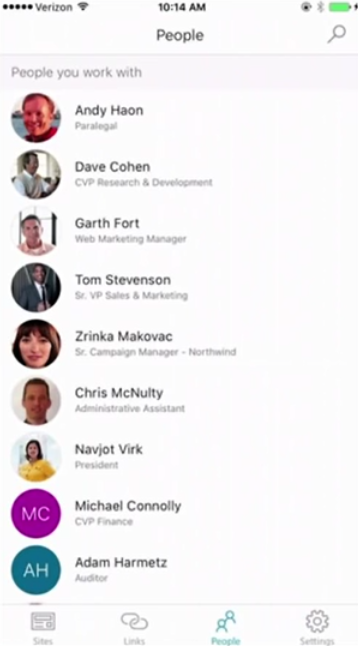 And tap in to profiles simply via People Tap. See the content they are working on and even communicate straightaway. Finally an all New home for SharePoint. The Left navigation is there but not the traditional ways it supposed to be in any previous versions. Sites and Links are nicely displayed in the left panel while the Frequent and Suggested items are shown in the Main area with the Office Graphs Intelligence. You can create a new site right away thought the link given and even follow a site straight from the same area. Either on Web or Mobile, All new Team Sites experience is just looks incredible. Finally Microsoft has bought the trending user experience to pages. 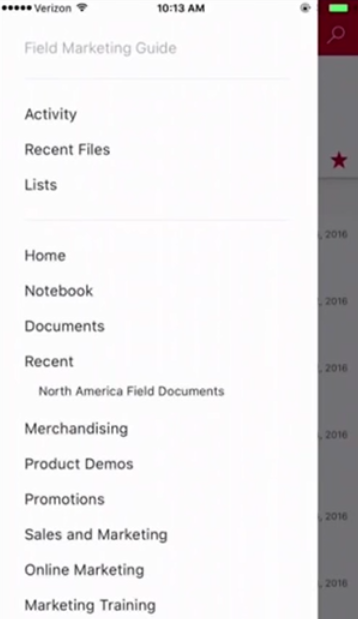 News and Activities are by default displayed with the power of office graph. Office graph is everywhere and it understands your work pattern and trend then brings you the most awaited experience all over the portal. All in all, the new site experience is definitely a huge change in terms of design and the performance perspectives. Creation of a Page, site or a library is incredibly faster than it was so that will simply grab the user adoption and attraction. Introduced under the Unified access and intelligent Discovery, a Seamless experience given to Libraries as your experience on OneDrive. 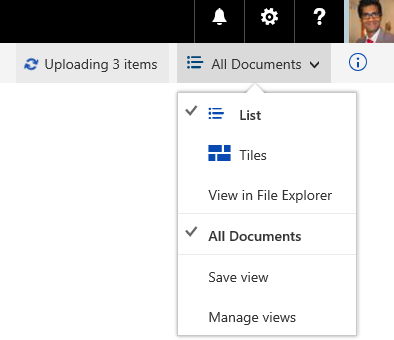 With these new Library improvements, you will get the same experience as you interact with OneDrive Interface. Faster Uploading and Syncing with more key board Interaction commands. This Library experience will provide you full power with the consistency of OneDrive. Doesn’t matter where you are and what type of a device you use, your experience will yet remain the same. Community was so much exited to see the insights. There were many rumors about this capability but the ultimate idea is to provide Comprehensive Security and Compliance power to SharePoint In-Premise which is powered by Office 365. Office 365 operates with a massive commitment to security, privacy and compliance. Insights will provide you the same capabilities to have in your in-premise environment via the Hybrid Integration. All new DLP (Data Loss Prevention) features will be then available to SharePoint in-premise as same as Online. The SharePoint Framework introduced and will be available soon. A Page and Part model based Open platform with full Client-Side development support was an incredible news for Developers indeed. This is much awaited renovation for long time and now here it comes at the right time with Mobile-First Cloud-First era. Pretty sure that developers are the most exited audience during the whole presentation. Microsoft Graph, Microsoft Flow, Power Apps, Power BI and finally SharePoint Framework. Now we know where we have been heading from last few years by seeing this lineup isn’t it? Yes the SharePoint feels to be just began ! SharePoint Srilanka User Group is a very active community for SharePoint lovers in Srilanka. I’m honored to present here for the second time under the topic of “Leveraging SharePoint Foundation as it’s max. "SharePoint Foundation Edition is an Great Startup Platform for those who expects big with no cost. let’s find out how we can leverage SharePoint Foundation towards business goals by utilizing as it’s max"
This session will be Primly focused on Foundation edition of SharePoint as still there are considerable amount of organizations and users are using it and expecting to leverage more with the same. This event is an recurring event which happens every second Wednesday at a month. two sessions are generally held where one session will take place for an hour and free meals are provided by Microsoft for everyone. indeed some giveaways as well. Event will be held at Microsoft Srilanka Office at 6.00 PM – 8.00 PM and it will be always free for everyone. See you there !